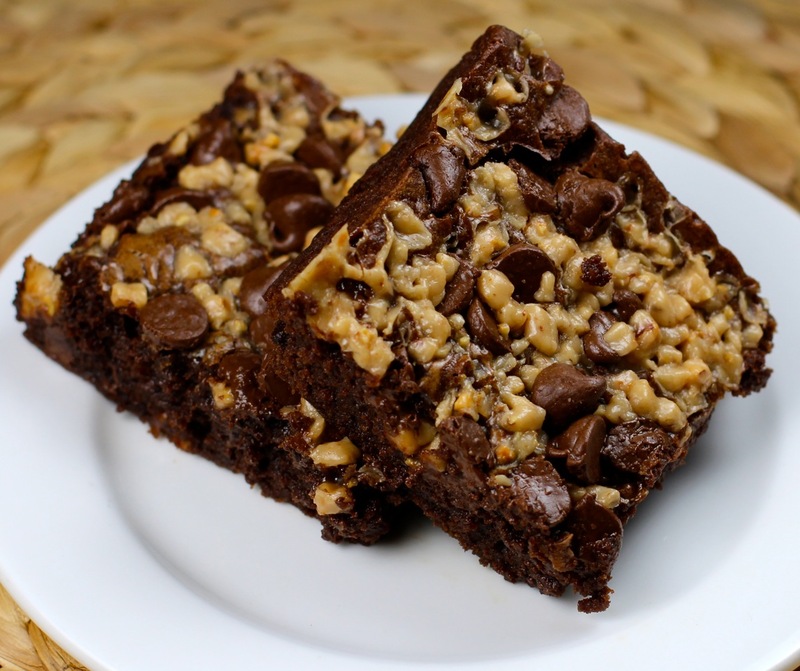 I love collecting brownie recipes and can never decide which is my favorite. I turn to these when I want the deep chocolate flavor of a brownie recipe based on unsweetened chocolate. These also have a deep caramel-like flavor from dark brown sugar and toffee bits. Semisweet chocolate chips are thrown in for an extra chocolate boost (wholly unnecessary, but very welcomed nonetheless). You can try the recipe as written, or, if you like the look of the picture, you can vary the recipe slightly. See how the top of the brownie is just covered with chips and toffee in the photo? One day I forgot to fold the toffee bits and chips into the batter, so I just went with the mistake and scattered them on top at the beginning of the baking time. Worked like a charm, and it is now my go-to version. Position a rack in the middle of the oven. Preheat oven to 350 degrees F. Coat a 13 x 9-inch pan with nonstick spray. Melt chocolate and butter in double boiler or microwave and whisk together until smooth. Whisk in brown sugar and vanilla. Add eggs, one at a time, whisking well after each addition. Whisk together the flour, baking powder and salt, add to wet mixture and fold in just until blended. Fold in 1 cup toffee chips and the chocolate chips. Scrape batter into pan. Bake for about 25 to 30 minutes. Sprinkle remaining 1/4 cup toffee bits over top. Continue to bake for 5 to 10 minutes. The top will look dull, a bit puffed and the edges will barely come away from the pan’s sides. A toothpick inserted in the center will come out with a few moist crumbs clinging. Cool on wire rack until completely cool before cutting. Store at room temperature in airtight container up to 2 days.